Asset Register for Excel provides a quick and simple way to maintain asset purchase records and calculate depreciation and book values to any month end date. The program steps forward as your system clock enters each new month and recalculates all book values. You can look up any asset record using Quick Look Up. 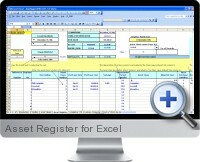 Program calculates profit and loss and net book value on disposals and maintains photo records. The summary YTD report combines all current balances. You can change the month end and recalculate depreciation and net book values. You can copy existing records held in your Excel into Asset Register using Copy and Paste, and use a form to enter new record information. It works exactly like a standalone database. Set up your own asset Classes and enter starting balances for each Class at the start of the current year. Class numbers are used to analyze records held in the Register. Asset Register Pro supplies calculation of month end depreciation charges by item and by Class, plus month book value, YTD and complete Register reports. Look up any asset record or Class ID for total month to date summaries. (The month end can be adjusted backwards or forwards). Analyze average costs per asset Class and numbers of assets per Class. You can use Asset Register for Excel to calculate depreciation and written down balances before or after the current month end with a simple change month entry. There is also a year to date Summary Report. Asset Register for Excel provides a complete ready-made register for recording assets, asset classes, dates of purchase, accounting expenses, depreciation periods, locations, General Ledger codes, and for calculating month end cumulative depreciation and written down values. The depreciation methods are straight line and declining balances.